Close your eyes and enter the Toucan Dream! We imagined a world where the colorful nature of the Toucan is painted onto its surroundings. Option Stuff Sack is available. Stuff all of your extras into this handy little sack! 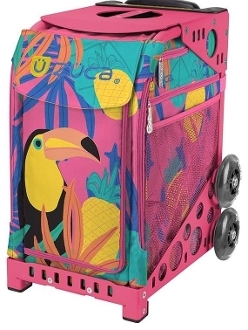 It slides over the handle on your ZÜCA so you can tote your books, magazines, snacks, gym clothes, sports gear, etc. around town. Made of ripstop nylon, you will be amazed at how strong this bag is and you can easily carry it in a pocket when not in use. These inserts are compatible with the ZÜCA Sport frame only.